Now that I have the attention of the Star Wars shippers out there…! August, 2017 marked the nine-year anniversary of the theatrical premiere of Star Wars: The Clone Wars. On March 11, 2013, it was announced that Lucasfilm would be cancelling the beloved television series. Anyone who knows me well, knows that I wept at that announcement, and went through the entire grief process, trying to come to terms with the loss. I pined for the characters, the stories, and just the idea of being able to look forward to each passing week, so I could fill the Star Wars need in my life. I listened to the beautifully compelling musical works of Kevin Kiner, reliving the emotional journey of some of the characters and pivotal scenes. Four years later, I continue to revisit the series, hoping to glean meaning and further fan sustenance from its episodes. One reason is because I love it so much, but mainly due to the fact that when the episodes were originally released, I had two small(er) boys at home, so I just gobbled up the content without much thought. There were, of course, arcs and specific things that became forever embedded in my psyche with just one viewing, but now, I have the time to sit down and really analyze the series. I have found that I understand so many new connections, have had several revelations and epiphanies, and now appreciate characters that I once just kind of skidded over, thinking they had no real lasting bearing on the Star Wars storyline or timeline. Case in point: Satine Kryze. Now, I know many of you are thinking “duh, I knew that,” but not only have I come to appreciate Satine as a character that holds important weight, I have also found some powerful correlations between she and Padmé, as well as each of these women’s relationships with Anakin and Obi-Wan, respectively. There are so many similarities, in fact, that I believe this to be an argument for a Star Wars Ring Theory candidate. If you are not familiar with Ring Theory, as proposed by Mike Klimo, I highly suggest you check it out. Basically, what Klimo theorizes, is that there are basic elements and/or themes in Star Wars that recirculate throughout the saga. Basically, a “what goes around, comes around” type of thinking. Padmé was elected queen and ruler of her homeworld, after having serving in the Legislative Youth Program. 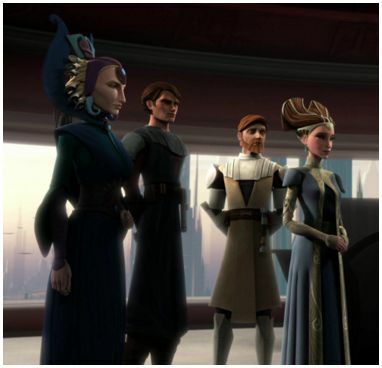 Satine became Dutchess of Mandalore, ruler of her people, and realigned the government to the New Mandalorian movement. Padmé sought to liberate Naboo from the Trade Federation, and when she became senator, voted against the Military Creation Act, creating hatred against her ideals and values. Satine sought to bring a more peaceful, pacifist attitude to the previously war-minded Mandalore, creating hatred against her ideals and values. Padmé co-existed with the Gungans, a cultural subdivision of the Naboo people. They lived separately in the core of the planet, and had their own ruler and government Satine co-existed with the people of Concordia, a group of exiled warriors whose ideals did not agree with the new Mandalorian regime. They lived separately on the moon of Concordia, and had their own ruler and government. A bounty hunter was sent to eliminate Padmé, sparking an order by the Jedi Council to send Anakin and Obi-Wan to protect her. Later, Padmé and Anakin fled to Naboo in secret in order to keep Padmé safe. It was during this time that the two started developing feelings for each other. As conflict grew, insurgency led to a civil war on Mandalore, sparking an order by the Jedi Council to send Qui-Gon Jinn and Obi-Wan to protect Satine. Later, after being attacked by bounty hunters, Obi-Wan and Satine went on the run in order to keep her safe. It was during this time that the two started developing feelings for each other. Padmé was later attacked a second time by deadly Kouhuns in her apartment, inserted into her apartment by a droid. The creatures were killed by Anakin with his lightsaber. Satine was later attacked a second time by assassin droids on her flagship. The creatures were killed in a joint effort by Anakin, a handful of clone troopers and…the final one met its doom with Obi-Wan’s lightsaber. The attempts on Padmé’s life were directly ordered by Count Dooku/Lord Tyrannus, a powerful figure and leader of the Separatist movement. He was opposed to Padmé’s stand against the Republic’s efforts to build a clone army. Dooku was secretly aligned with Darth Sidious. The attempts on Satine’s life were directly ordered by Pre Viszla, Governor of Concordia, and leader of Death Watch. He was opposed to Satine’s pacifist ideals and wanted to see Mandalore return to its warrior heritage. Pre Viszla was secretly aligned with Count Dooku. Padmé became a leading member of The Loyalist Committee during the Clone Wars, with the goal of bringing peace between the Republic and the Confederacy of Independent systems Satine became Regent of the Council of Neutral Systems, a network of over 1,500 systems who wished to remain peaceful, having no part in the war. Padmé rescued Anakin from dying at the arena on Geonosis. Satine rescued Obi-Wan from dying at the hands of Death Watch. Obi-Wan senses Anakin’s attachment to – and relationship with –Padmé, but overlooks it (until Revenge of the Sith). Anakin senses Obi-Wan’s attachment to – and relationship with – Satine, and effectively teases him about it. Anakin and Padmé pursued their relationship, keeping it a secret, thereby sacrificing their basic values. Ultimately, this led to Padme’s death, at the hands of a Sith Lord (Anakin himself, Darth Vader), somewhat as a form of reaction to Obi-Wan’s “betrayal.” Obi-Wan and Satine refused to pursue their relationship, despite the love they felt for each other, and stayed true to their basic values. Ultimately, their love was used as a catalyst in Satine’s death, at the hands of a Sith Lord (Darth Maul), as a form of revenge against Obi-Wan. I was actually stunned at the amount of correlations/comparisons I was able to produce, and I’m sure there’s probably some things that I’ve missed, so that’s where you come in! What do you think? Is there anything to add here? How do you react to these? Please leave your comments below, or hit me up on Twitter @JoyceKrebs. I would love to hear your thoughts! Oh, for all you shippers out there, I also think it pertinent to mention that the official #Obitine week is September 10-16, 2017! I don’t think there’s an official ship name for Anakin and Padmé. I just made up Padakin on my own … maybe Anamé…? That sounds too much like “Anime” in my opinion! Be sure to check out the YouTube channel for Clone Wars Conversations with James Arnold Taylor! There’s no better way to get a chance to hear great Clone Wars behind-the-scenes stories! One episode in particular you might want to watch is the one where he talks to Satine herself, Anna Graves. The most popular portmanteau in use among “shippers” for is Padme and Anakin is Anidala. Thank you for that info!! I never would’ve thought to put their names together that way! I especially like the way you set up your table, comparing the links between Padme and Satine and their arcs through the Star Wars storyline.